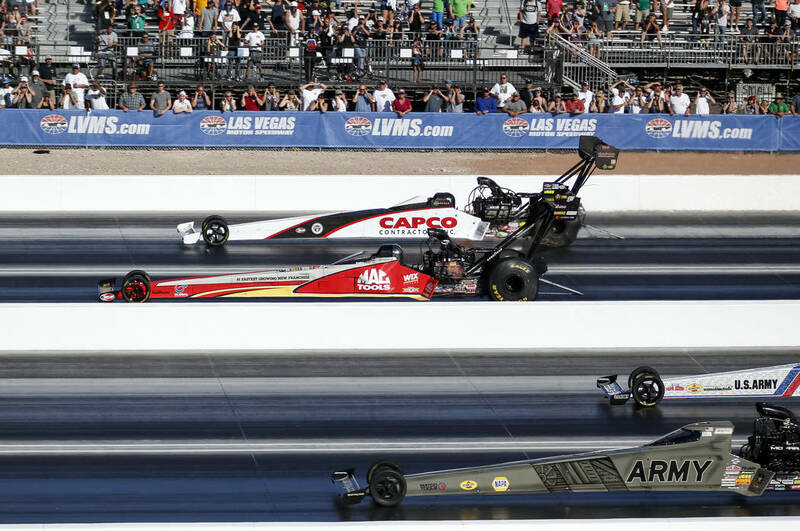 It was billed as twice as wide and twice as loud but it was 10 times the fun for DENSO Spark Plugs NHRA Four-Wide Nationals winners Steve Torrence, J.R. Todd and Vincent Nobile. 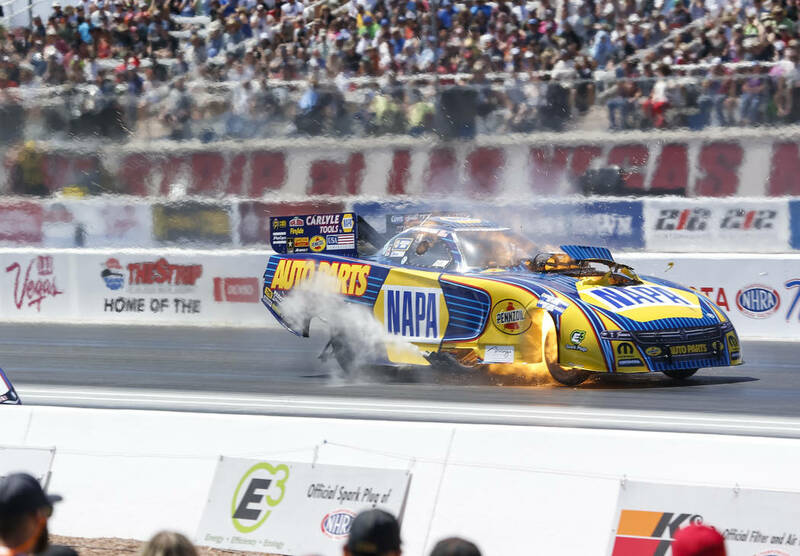 A Funny Car driven by Ron Capps takes off from the starting line during the first round of final eliminations on the final day of the DENSO Spark Plug NHRA Four-Wide Nationals at The Strip at Las Vegas Motor Speedway in Las Vegas on Sunday, April 8, 2018. 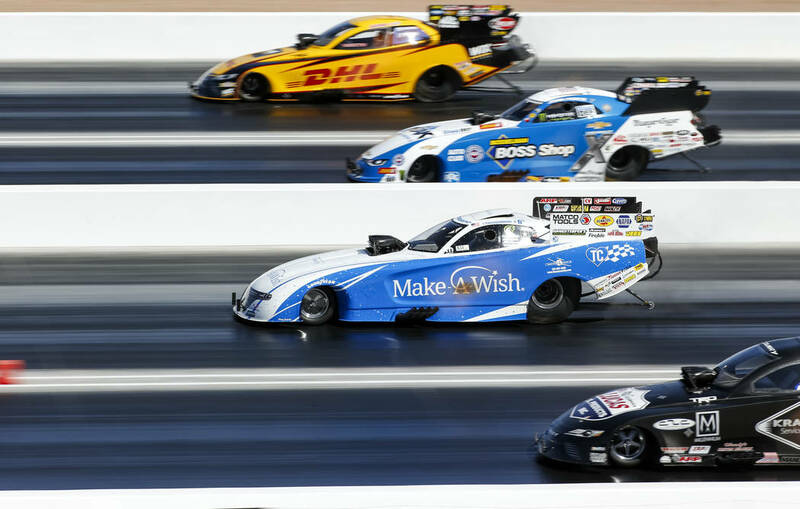 Pro Stock drivers, from top to bottom, Chris McGaha, Jed Coughlin Jr., Alex Laughlin and Matt Hartford take off from the starting line during the first round of final eliminations on the final day of the DENSO Spark Plug NHRA Four-Wide Nationals at The Strip at Las Vegas Motor Speedway in Las Vegas on Sunday, April 8, 2018. 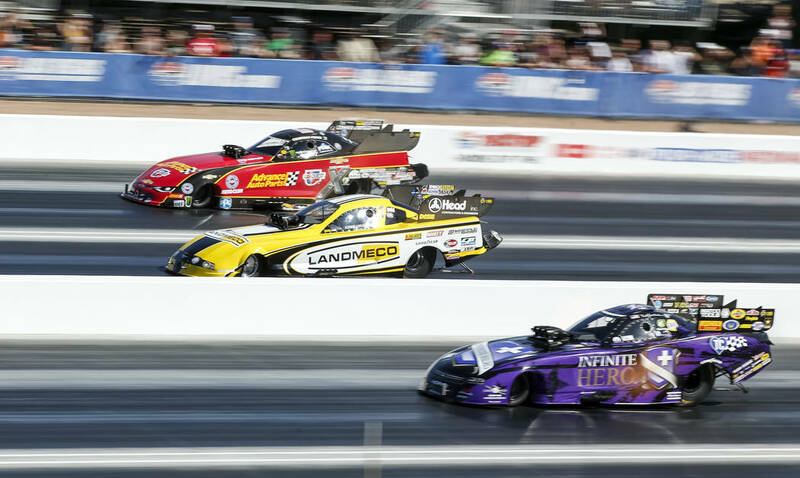 Funny Cars take off from the starting line during the first round of final eliminations on the final day of the DENSO Spark Plug NHRA Four-Wide Nationals at The Strip at Las Vegas Motor Speedway in Las Vegas on Sunday, April 8, 2018. 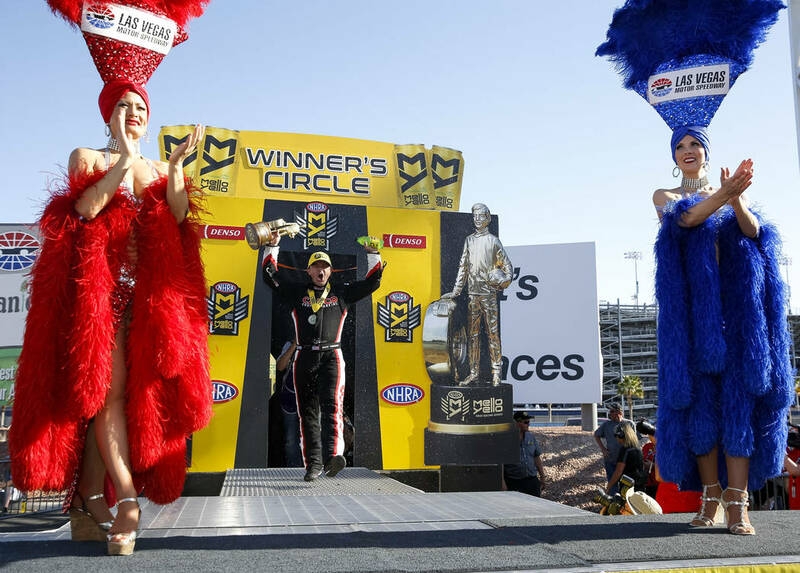 Their smiles on the victory platform were wider than the new track at The Strip at Las Vegas Motor Speedway. 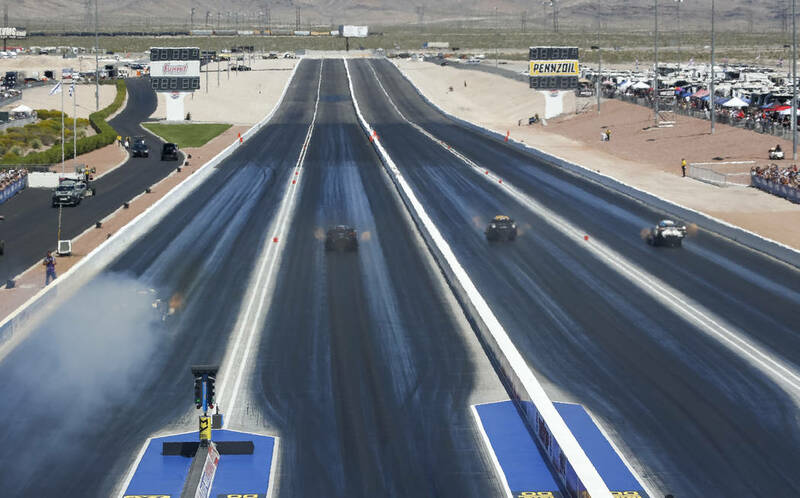 One of the pacesetters said he might even be taking a shine to this crazy thing called four-wide drag racing. 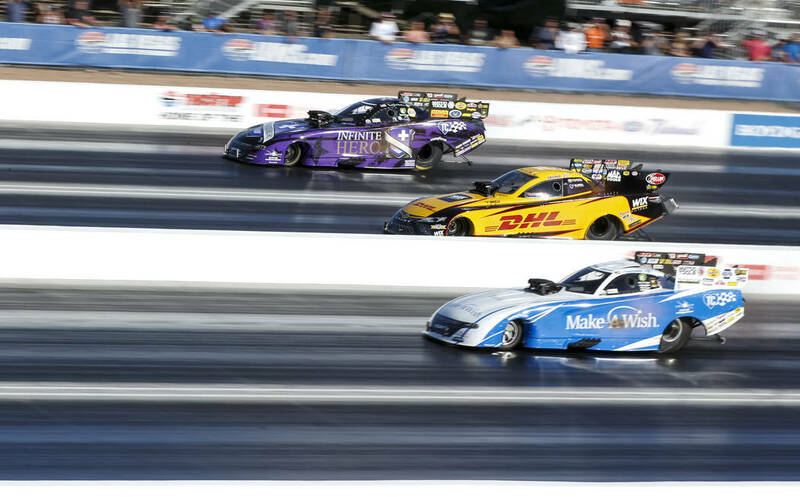 The Kalitta Motorsports driver got the holeshot in a final that included Jack Beckman, Tommy Johnson Jr. and No. 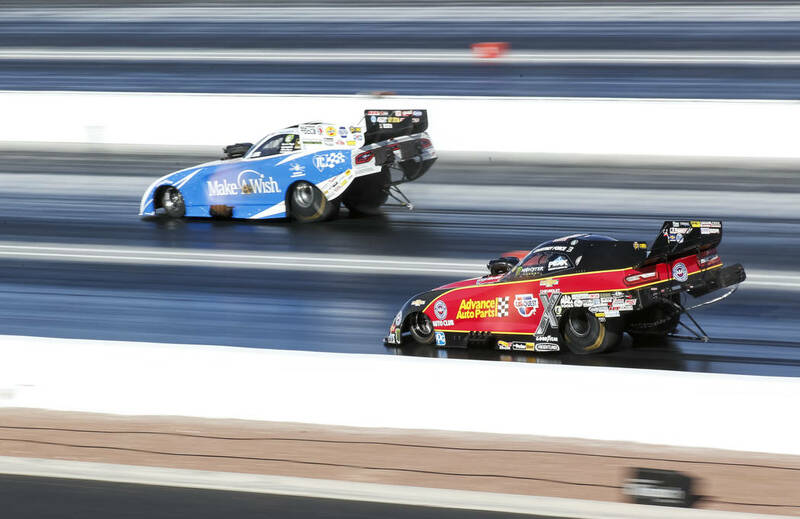 1 qualifier Courtney Force. 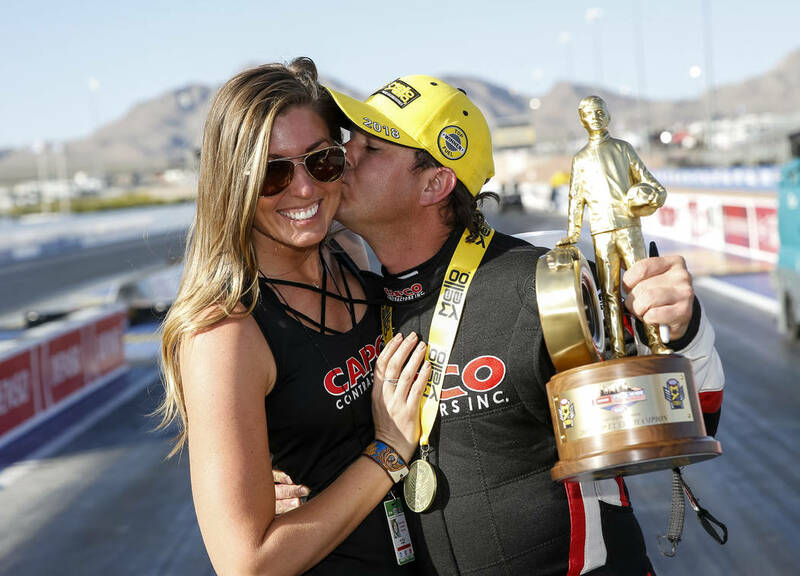 Torrence, who seemed destined to win last year’s Top Fuel championship before finishing runner-up to Brittany Force, started 2018 strong with a victory in Phoenix during the second race meeting. 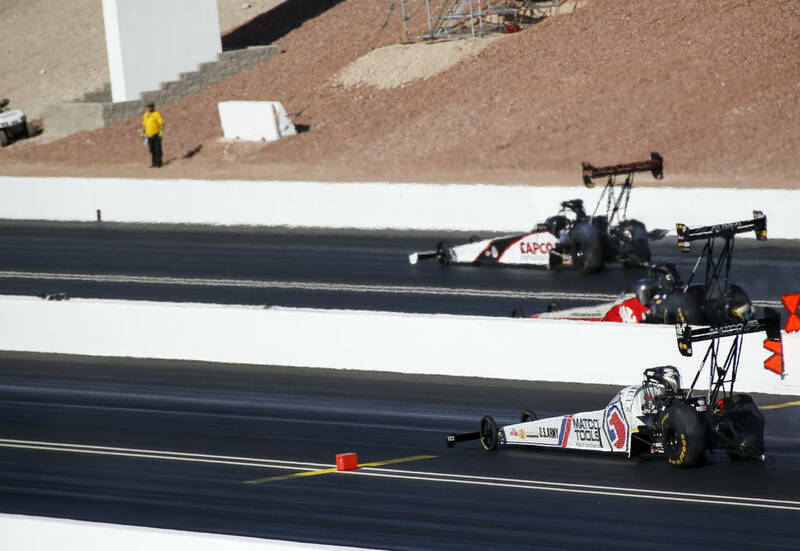 He said he didn’t expect to win at LVMS on four lanes, two lanes or any other combination of lanes. 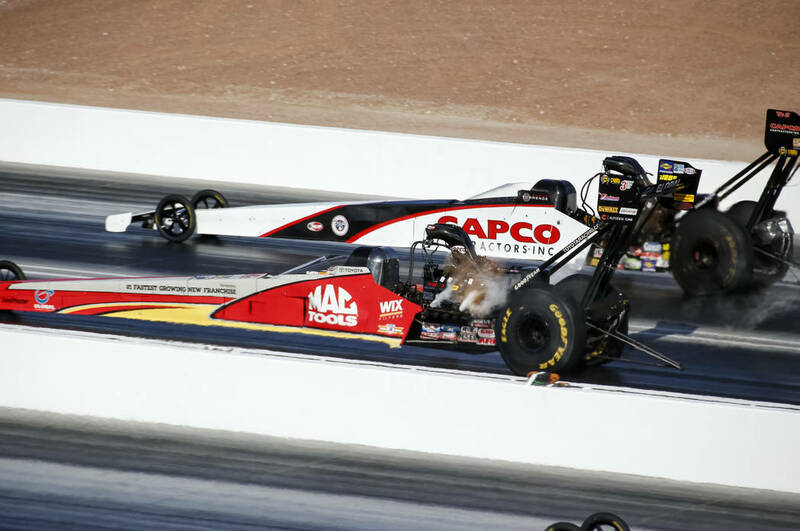 “We rode the struggle bus all the way through qualifying,” said the second-generation driver who defeated his father, Billy, in the first round Sunday and an all-star final quad that included multitime champions Tony Schumacher and Antron Brown and always formidable Doug Kalitta. 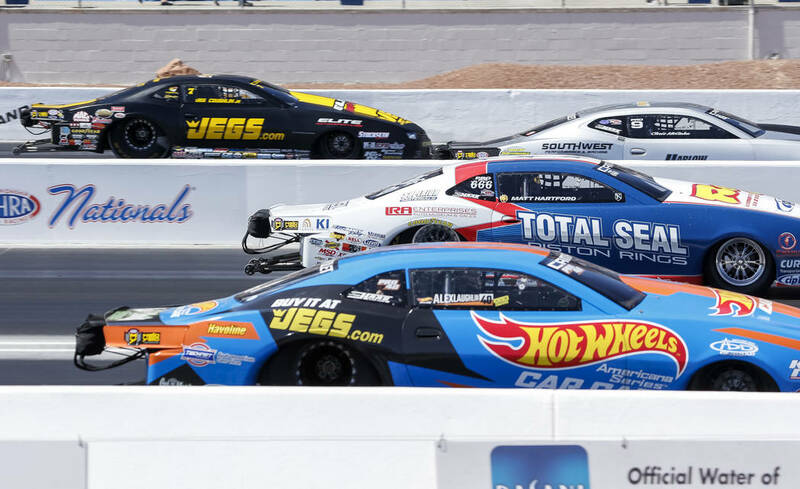 It was a tough final as well as a close final for Nobile — the Camaro driver won his 10th Pro Stock race but first in two seasons by stopping the clock .0007 ahead of Deric Kramer in the final quartet. 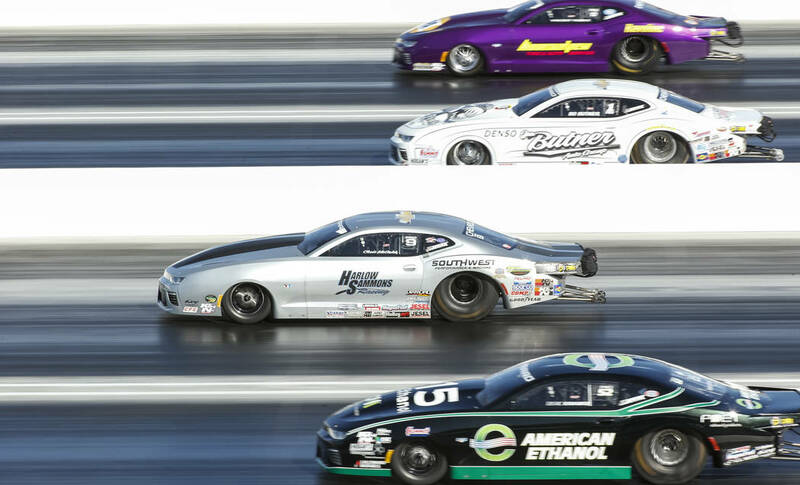 “That was our third engine this weekend — which is three too many for a Pro Stock car,” Nobile said. 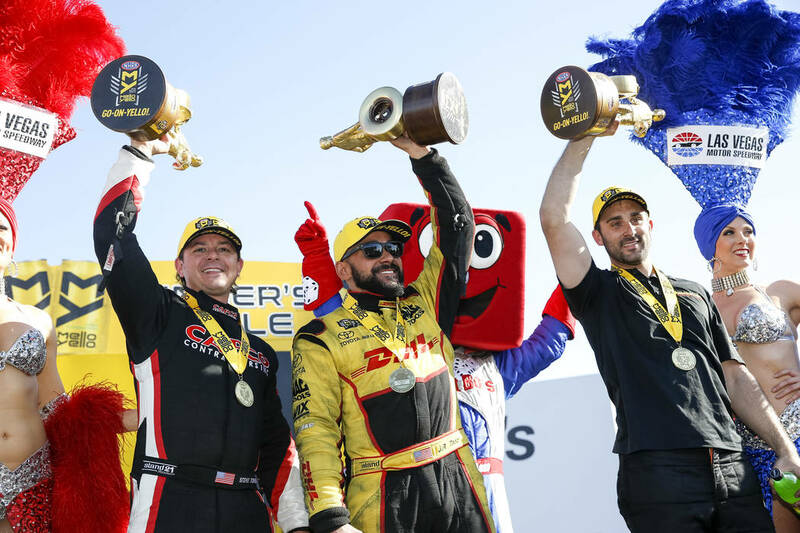 Sunday’s winners, as was the case with virtually all the drivers, lauded LVMS for building a near-perfect race track. 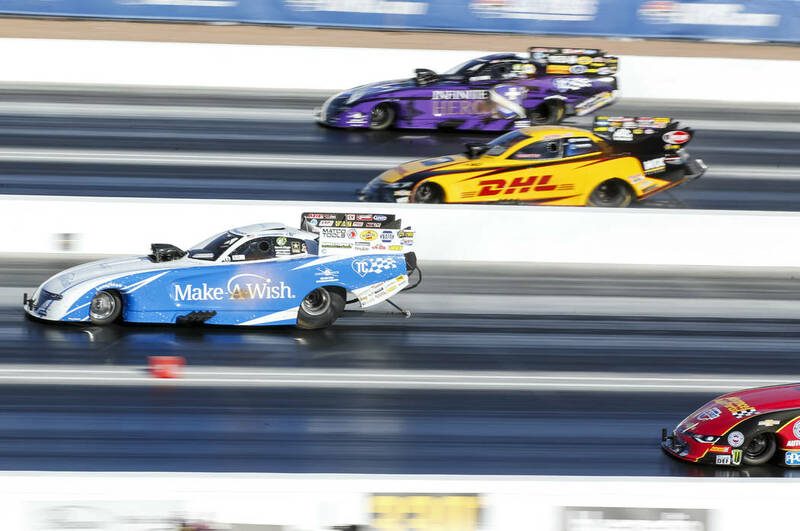 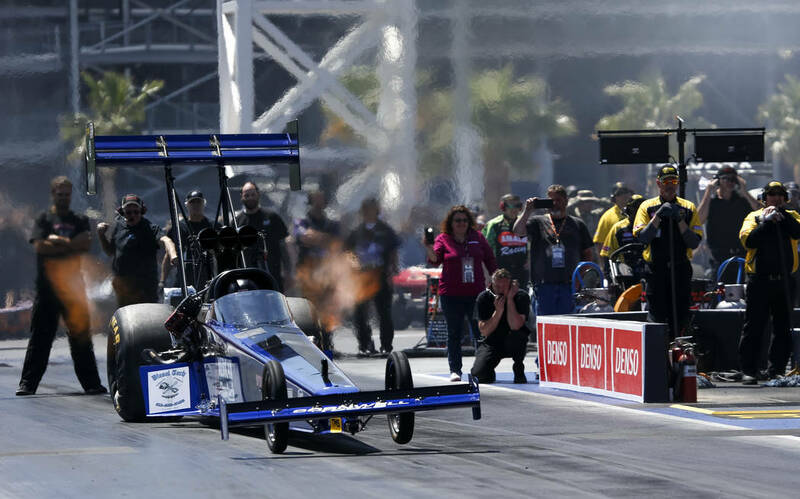 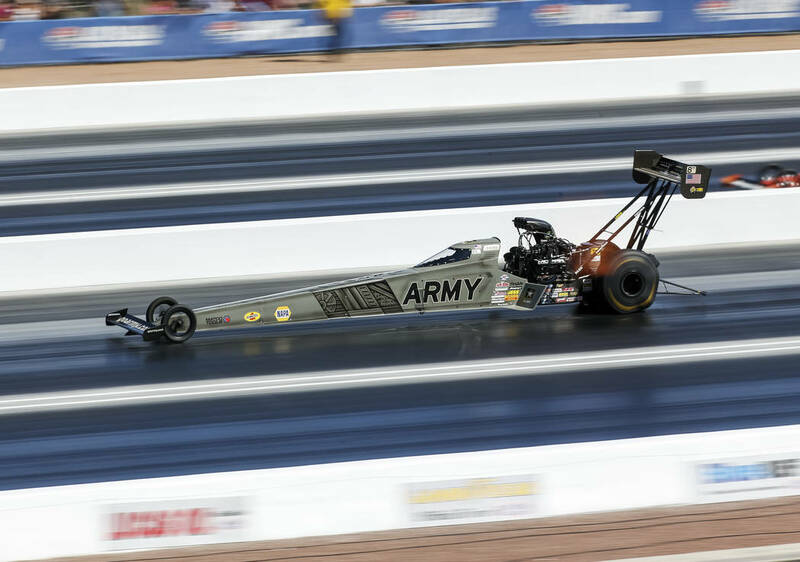 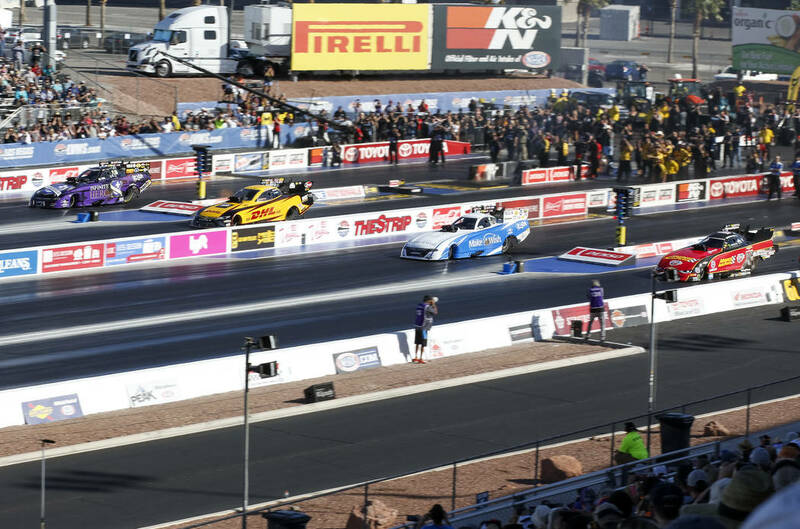 ■ LVMS’ first four-wide NHRA drag race was an overwhelming success as both Saturday qualifying and Sunday final eliminations attracted sellout crowds, estimated at about 25,000. 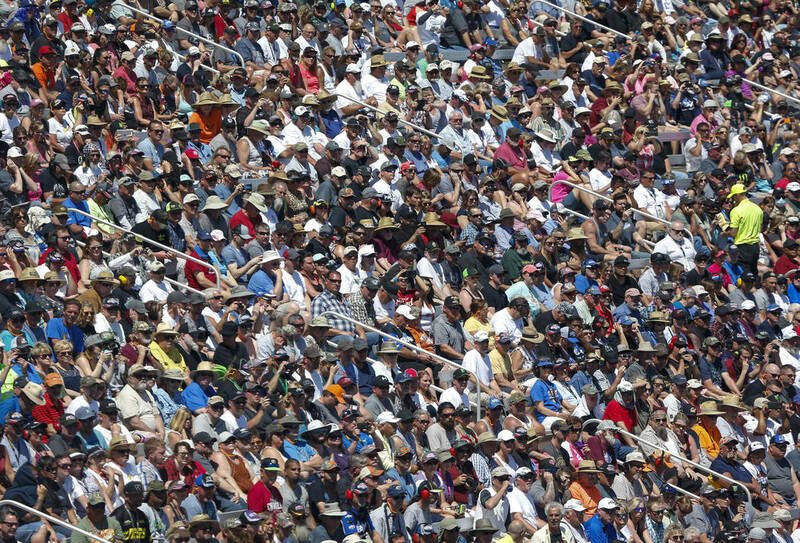 It was the first time the spring race drew multiple announced sellouts. 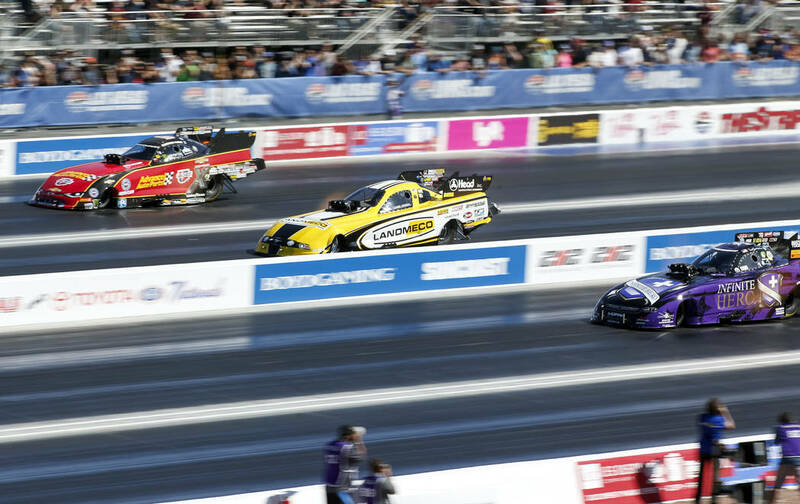 ■ When the NHRA cars return for the Toyota Nationals Oct. 25-28, they will run on only two lanes. 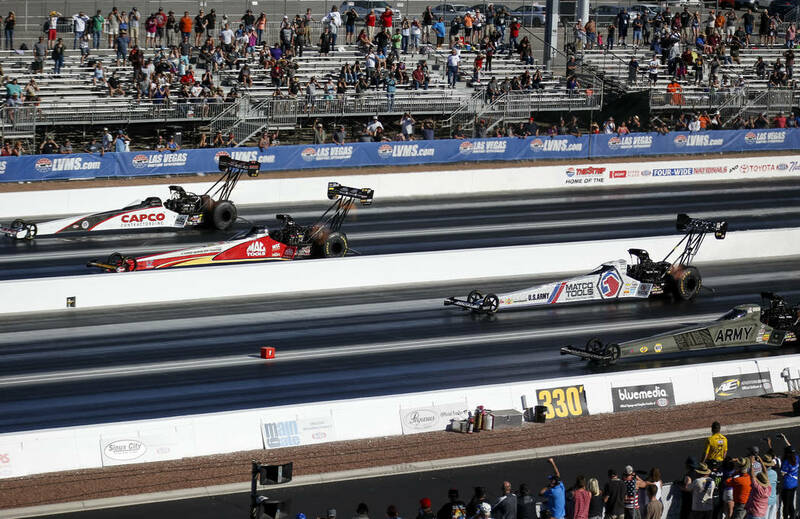 The second LVMS race will be the penultimate event in the Countdown to the Championship, the six-race playoffs that determine the NHRA champions.